I’ve read J.G. Ballard’s The Drowned World and in his afterword he mentions his childhood in China, which reminded me that I still hadn’t watched Empire of the Sun, which is based on his childhood experiences. 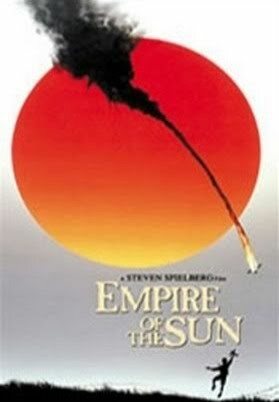 Empire of the Sun is set in Shaghai, in 1941 and tells the story of a young boy. Jim’s (Christian Bale) parents, like so many other of the rich Brits living in Shanghai, didn’t react in time to the aggressions of the Japanese. Many thought that they wouldn’t risk anything as they were not Chinese; they believed they were protected by their status as foreigners and their money. But they were wrong. When the Japanese troops finally invade, it’s too late. Most of them try to flee, leaving behind their houses and all of their possessions. In the general chaos, Jim loses his parents and has to fend for himself. At first he returns to their beautiful mansion, but the food is soon gone and he starts roaming the streets until he meets Basie (John Malkovitch). Basie is an expat just like Jim’s parents were but he’s a very different kind. A hustler, a thief, someone who lives from hand to mouth. He sees that Jim is from a rich background and decides to look after him. Whether there is some genuine kindness or pure calculation isn’t so clear at first. What is clear is that they get along like a house on fire. Jim is a precocious, extremely intelligent and crafty kid – also terribly annoying – and they complement each other perfectly. When they are finally arrested by the Japanese and brought to a POW camp, they survive doing what they know best, dealing and stealing, and making money out of everything. The time at the POW camp is one of great liberty for Jim. He’s soon known by everyone and while he’s an obnoxious kid, they also like him and find him very useful. Despite of the danger and captivity Basie and Jim are doing great for themselves, help each other out, or rather profit from each other. Still, the war leaves traces and when they can finally leave the camp, they are both altered. I loved the beginning of this film, the cinematography is amazing and the story is fascinating. Basie and Jim are larger-than-life characters, the kind you admire and despise at the same time. At least I did. Christian Bale did an amazing job at portraying Jim. What an annoying kid that was. He talks and talks endlessly and while he’s crafty, he never knows when to stop or give it a rest. Basie is ingenious and maybe, he means well at times, but mostly he’s the type of character who will always be able to make money, preferably even through selling out others and profiting from their misery. There are a few tense moments, but overall we often get a feeling that this is less a POW camp than a summer camp. I was wondering if that was because Spielberg tried to stay true to the boy’s point of view or whether these camps for civilians were not that bad. It’s a highly watchable movie and one I will certainly watch again, but unfortunately, the film has a lot of typically cheesy Spielberg moments, which annoyed me. I still think it’s a beautifully filmed movie and a great story. I liked it, but didn’t love it because I hate it when director’s manipulate us. Spielberg always does that, that’s why I don’t really like Schindler’s List and even think Saving Private Ryan could have been much better than it is. This entry was posted in Children and War, History, Japan and WWII, Movie, POW, Reviews, Trailer, War Movie and tagged Children and War, Christian Bale, Empire of the Sun, POW, Steven Spielberg. I am not a Spielberg fan, but I saw this many years ago–around the time it was released. I remember enjoying it at the time, but I don’t have a desire to go back and rewatch it. I would rewatch it because I thought it was very well filmed but it had anyoing moments. If I didn’t know Spieberg, I would maybe not have minded so much. I didn’t love it like I did Hope and Glory or it didn’t move me like some of the others that hosw children and war. I don’t know why I haven’t reviewed this yet. I think I watched it a while back. I agree with you that it is marred by the Spielberg touches (which have gotten worse as time has passed – see “War Horse”). It left me a bit cold. It is certainly not in a league with the similar “Hope and Glory”. I’m so surprised. I thought you loked it a great deal. I suppose, since I?ve just watched War Horse, I was far more attentive to those touches. In some way, I thought it was OK in WAr Horse as it’s meant to be a movie for kids. Not sure that was the case here. Except perhaps for being the only performance of Mr Bale I could ever stand, I have little memory of it. I think he is very good in Rescue Dawn and not as annoying as here.